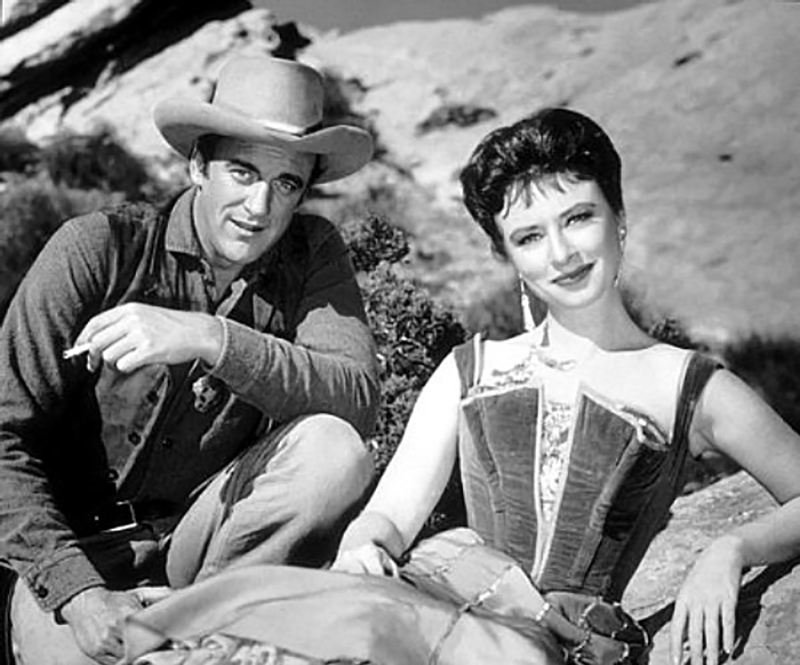 SCVHistory.com LW2109 | Film-Arts | Gunsmoke: James Arness & Amanda Blake at Vasquez Rocks. James Arness (as Marshal Matt Dillon) and Amanda Blake (as Miss Kitty Russell) from the long-running television Western, "Gunsmoke" (1955-75), on location at Vasquez Rocks in Agua Dulce. "Gunsmoke" was the longest-running scripted primetime TV show in television history when it hung up its spurs in 1975. It all started 20 years earlier at Melody Ranch in Placerita Canyon. Melody Ranch wasn't used exclusively during the early years of "Gunsmoke" (they also filmed at the Iverson Ranch in Chatsworth and other locations for a change of scenery), but it was used frequently — from the original title sequences in 1955 until 1962 when the Longbranch Saloon and the rest of Gene Autry's Western movie town — and some of his guns — went up in smoke. James Arness (Marshal Matt Dillon) discusses the early days in this television interview.